Before the Communist era, the cream of Chinese society lived in Xicheng, Beijing’s largest district. Also known as the West City, Xicheng is now a microcosm of modern Beijing, where new and old China meet and harmoniously co-exist. Those looking for touches of Old China can visit the imperial garden of Beihai Park, built in the 10th century, a showcase of Chinese architecture, with intricate pavilions, glorious canals and rich Chinese garden art. Or they can visit the Cathedral of the Immaculate Conception, built in 1650, the oldest Catholic church in the city. This large baroque church has survived many natural disasters, and is popular with foreigners due to its English services. Those looking for a more modern Beijing can visit ritzy Jinrong Jie (Finance Street), or drop by the Hou Hai area, known for exciting entertainment, and great dining. Other places of interest in Xicheng are its hutongs, and Beijing Zoo. 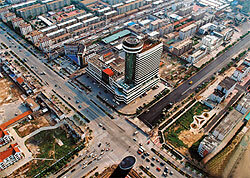 Xicheng is home to Xidan, one of Beijing’s more famous commercial areas. It developed during the Ming Dynasty as a passageway for traders entering Beijing. Eventually, shops and eateries catering to these merchants appeared. It became a commercial area, and today it is full of supermarkets and department stores. Xidan is home of one of Beijing’s largest cultural venues, Xidan Cultural Square. And there’s Xidan Wall, a symbol of democracy and the power of the people.